"And, why do you do that?" This weekend I have been learning how to make crocheted beaded jewelry. Every teacher in a bead store will tell you that this is a complicated technique. I went to my first class last Wednesday, and will go to the second this week. Because I strung the wrong beads in the wrong pattern for my class last week, I had to start anew yesterday, and that meant that I had to start the project off, just six little beads crocheted on a very thin thread...and somehow I made it work. The process is so difficult that the next class will teach us how to start and finish, so I am ahead of the game. I had no choice, since my original string was useless. I did it! Yay! Another addiction in progress. A year ago, I developed a trigger finger. The index finger of my right hand developed a cartilage problem, probably from overuse. I had to wear a splint for several weeks. I went to the hand therapist that the hand surgeon referred me to. She asked me to tell her how I use my hands. What don't I do? I type all day, and then make jewelry all night and all weekend. In my off hours, I knit socks and crochet afghans. I carefully explained the process for making peyote stitch beads. I explained that you take tiny perfectly cylindrical Delica beads (made in Japan, of course, where they know perfection) and I weave them using silk thread to make peyote beads. The therapist looked at me and said, "And....why do you do that?". Well. Because. Because making things is in my blood and I spend most of my free time, and risk overusing my hands, just to do these things. I don't know why. Why do ducks like white bread? At my class the other night, I was with several other people who also love to make things, and one lady and I shared our stories of making socks, and how much we love making them, the kind of yarn we like (she is making some using yarn made from seashells, and I like soy fiber) and how many we have made...dozens of pairs. She stuck out her foot, showing her beautiful striped handiwork and her Birkenstocks. Now, that is a lady who understands! She wouldn't say to me, "And WHY to you do that???" So, here I am this weekend, learning how to make crocheted beaded jewelry. I plan to learn how to finish these bracelets in class on Wednesday and to wear them to New Orleans. The next one is Marti Gras colors: purple, gold and green. After that, I will just make them because that is what I do. It is 7 p.m. on Friday and George is upstairs sleeping. I am quietly enjoying trying to learn how to crochet beads into pretty ropes. My right hand hurts from the effort and I'm wondering if my hands will hold up to the task. Last night we had a really big night. We went to a local club, Johnny D's in Somerville, and had dinner with friends and got to hear a band from Louisiana, Steve Riley and the Mamou Playboys. Their music gets you dancing, and even though it was a work night, George and I kicked up the rug a little and had a good time. Actually, we did a great waltz around the floor, and tried to stay true to the way the Cajuns dance in Louisiana, calmly traveling around the floor to the fast beat of the music. But last night most of the dancers were doing some variety of bebop...hopping and twirling around. People in Cajun country don't dance like that, but hey, everyone was having a great deal of fun, and we were too. It was great to to go out on a weeknight and not worry about tomorrow. Dinner last night was a wonderful Brazilian fish stew with rice, mussels, shrimp and white fish. It was perfect. We had a two hour dinner, because we needed to get there early in order to get a seat at a table. The place is small, and we were only 40 feet from the band. The music was really great, as always, and we had a fabulous time. 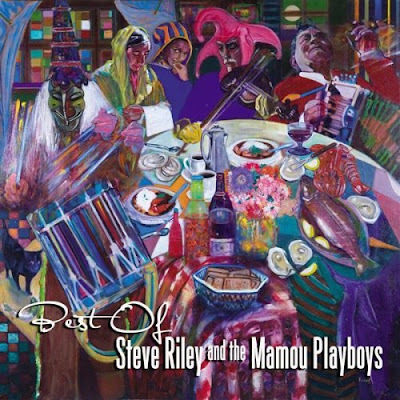 I can't wait to go to New Orleans and Mamou and Henderson in a couple of weeks for more of that music and to hear the Pineleaf Boys. I'm so excited! Now I'm going to listen to some of that good Cajun dance music and keep on crocheting these tiny beads. Have a great nap, George. I just got home from a beading class and I made this. Hum. It started to remind me of little beaded souvenirs you see from Guatemalan ladies who have been bead crocheting for hundreds (thousands?) of years. This little bit of not very good crochet work took me two hours. Next Wednesday I will go to the second two hour class, and hopefully will come away with something a little more glamorous. 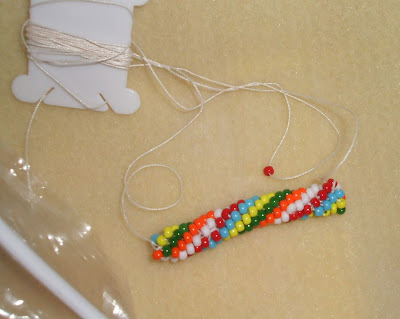 Bead crochet, when done well, and with beautiful beads, is going to be really fun. I just have to get through the ugly duckling stage. Thank you, George. They are beautiful! Last night George and I hosted the annual Hearts Party at church. Twenty two people showed up for a chili supper. We had to overcome a disaster on our way to the church. Just down the street from our house, someone started to back out of their driveway, and George hit the breaks. They stopped. We stopped. We started, and they started backing out again. This time George hit the breaks a little harder. I screamed..."the Chili!". We went back home. Sure enough, the chili in the pot in the trunk had splashed all over the place. It was in a box with newspapers and kitchen towels, but the lid had flown off into the trunk and there was chili slurped everywhere. It was a disaster. We lost about six cups of chili off the top of the pot, and had a really messy clean up job. We were a little late to church, but someone else had brought a pot of chili too, so after we swabbed the pot and ourselves (it was a real mess), we heated our chili and there was plenty for everyone. Twenty people had a lot of fun playing cards and two people sat out because they planned to anyway. The game ended at 9:30 with a playoff, and I was in the top four women, the lowest scorers. During the play off game, everyone got a heart except me. I win! I'm the Queen of Hearts for 2009! 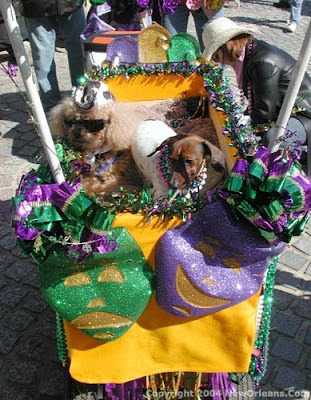 Today after our recovery nap, we were looking at the parade cam for Marti Gras in New Orleans. 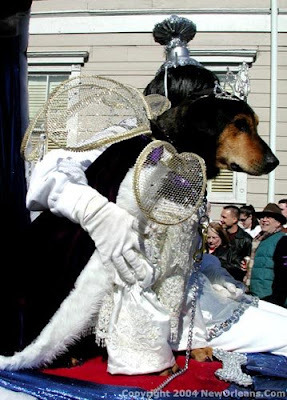 Our favorite parade today is called "Barkus"....for dogs only. Oh, they get silly in New Orleans! 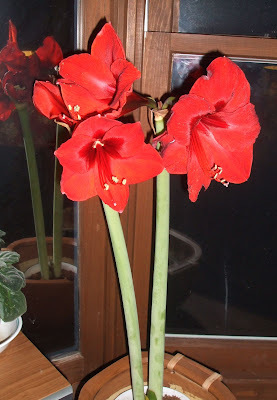 Long before Christmas George and I bought a box containing and amaryllis bulb, and planted it in it's little white plastic pot. I don't like that pot very much, but that is what they come with. 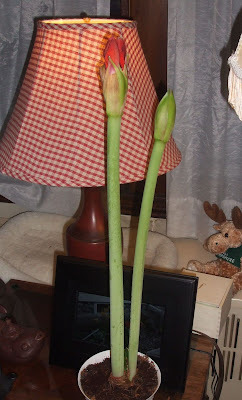 For several weeks, the bulb just sat in its pot and did nothing. I thought maybe it was too cool, so I put it on top of the stove under the overhead lights. Gradually, one centimeter at a time, the bulb started to send up a shoot. Then there were two little shoots. 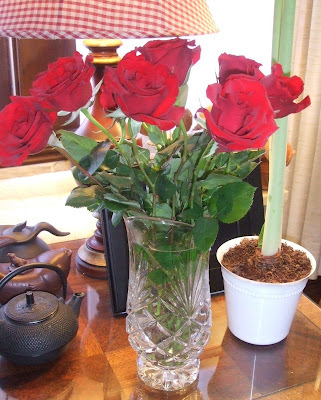 I kept it watered with warm water, a little at a time, and gradually, gradually, it started to grow. I kept it on the stove for three weeks! Then, it outgrew it's area on the stove. The blossom was one inch from the light bulb when I moved it to the living room. It is still growing! 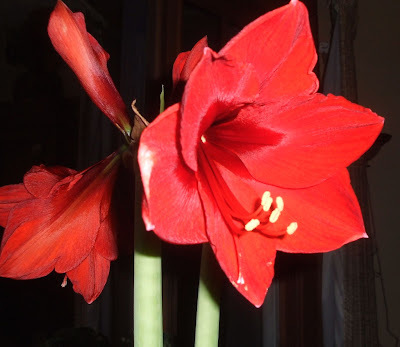 Now the Amaryllis has been in our family so long we don't even remember when we got it. We have grown used to this albatross growing in our house. Up and up it goes. 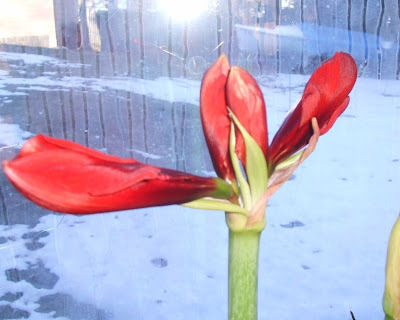 Finally, two days ago, the first tight blossom has started to break open....and it has been 3 days since THAT started to happen. It is so tall it has outgrown the pot and just looks silly. We are all still waiting. Waiting. Hey, maybe it's waiting for Valentines Day! 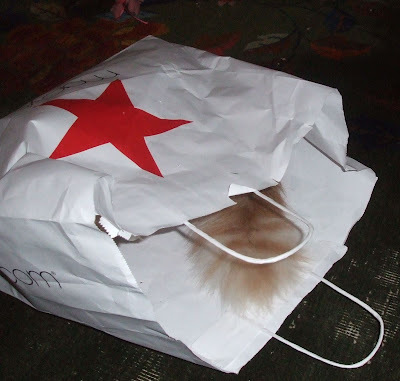 On Saturday we went to Macy's to look at the sales. I bought a couple of things to wear to work. 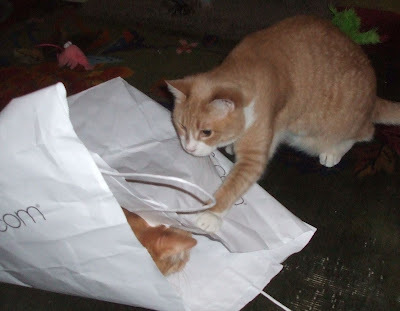 Little did we know that the bag from our Macy's trip would bring endless hours of fun for the kitties. 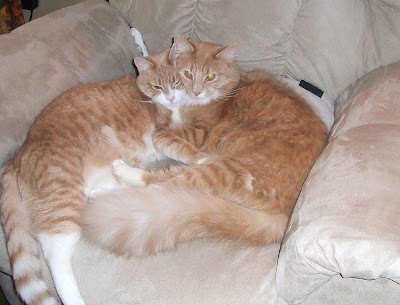 They have been playing in the bag for two days. 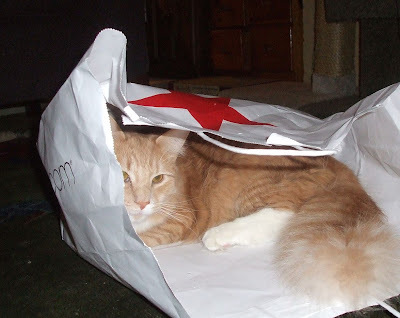 Today we thought the fun was over and we put our newspapers into the bag for recycling, but Safari looked so longingly at the bag, trying to see how she was going to fit in there with all those newspapers, that we had to take the papers back out and turn the bag again into just the most fun kitty toy you ever saw. Today is Monday morning, and it is a really fine day. Years ago, I used to have something I called the Sunday Night Syndrome, where I dreaded Mondays and started the downward spiral sometime on Sunday afternoon. I knew it was irrational, but I couldn't seem to help myself. Today that Monday morning syndrome thing is all gone. I no longer stress about work on Sundays, and I look forward to each day the same. Monday is the beginning of another exciting week for me, and I feel very very lucky to like my job so much. This weekend I felt that I should probably have someplace to go, or something exciting to do, but I didn't. Instead of finding my fun outside the house, I bought some paper and made valentines. I mailed them this morning. The process was really fun. As I sat and cut out paper hearts, and embossed the cards, I realized that i was going back to the creative process that children have when they make things just for the fun of it. I wasn't going to make any money doing this, I wasn't probably going to learn that much (although I did learn a better way to take glue dots off the backing), and I wasn't spending my time doing anything that would impress others. But I had a great deal of fun all by myself, cutting out hearts and pasting them on cards and making designs that I thought others would enjoy. I mailed out 10 valentines this morning at the post office. I can't think of a better way to start off a Monday morning.